A Blepharoplasty is a procedure performed on either the upper or lower eyelids to improve ones appearance around the eyes. There are many reasons to consider a Blepharoplasty including a perpetually tired appearance, wrinkling, too much fat around the eye, shadows or dark circles and even obstruction of vision due to the excess skin blocking ones field of vision. Are the problems affecting the upper and lower eyelids the same? No. There are many differences between the upper and lower eyelids and treatment requires different approaches for each. The problems of the upper lids are generally one of stretched, loose or excess skin and muscle, which can hang down onto the eyelashes and below causing a tired and aged look as well as blocking a portion of the visual fields. The problem of the lower eyelids is most commonly one of too much fat behind the eyelid, which pushes outward. This creates a mound or pillow under the eye and since most light comes from above us, this causes a shadow beneath that fat pad. This gives the appearance of dark circles under the eyelid, which is perceived as making one look tired. Fatty accumulation can also affect the upper lids as well. Both the upper and lower eyelids can also be plagued with wrinkles due to years of sun exposure, the aging process and smoking. 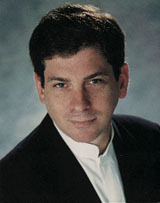 This too, can be successfully treated by a well-trained, board-certified Los Angeles Plastic surgeon. How are the upper eyelids treated? Treatment of the upper lids is directed at removing the excess skin and muscle, which is causing the tired or aged appearance. Any protrusion of excess fat can be removed at the same time. The treatment will take away the tired appearance, possibly improve vision and allow women to apply make-up easily and cleanly. The procedure requires an incision, however this can be placed in the eyelid's natural crease, which makes the healed scar well camouflaged and nearly impossible to see when the eyes are open. By placing the incision in this location, Dr. Warren Lent, a Beverly Hills Plastic surgeon says "we can achieve the best possible healing". 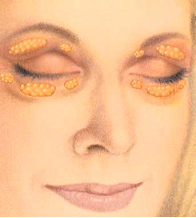 In general, the eyelids heal better than just about any other location of the body. How are the lower eyelids treated? Treatment of the lower eyelids is most commonly directed at the fat pad, which causes the shadowing and appearance of dark circles, which give one that persistent tired appearance. Dr. Lent, the Beverly Hills Plastic surgeon says, "there are several ways to perform this procedure, but the safest way is to approach the problem from behind the eyelid with, what is called a "Transconjunctival" approach". 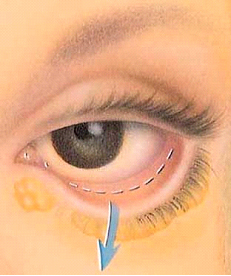 This technique helps prevent scarring from getting into the actual eyelid mechanism, thus preventing that terrible pulled down appearance that so often affects the lower eyelid when the 'old fashion' method is used which requires an incision on the outside of the lid. By removing the excess fat, you remove the cause of the bulging and eliminate the shadowing and its' associated tired appearance. Patients often worry about whether the skin will tighten or sag afterwards. This is usually not a problem as the skin has a natural elastic quality, which allows it to shrink into place and therefore sagging is not an issue. Additionally, wrinkled or loose skin can be tightened with laser resurfacing of the outer skin. 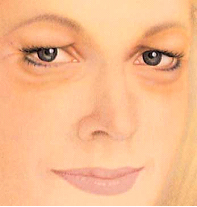 Many physicians advocate removal of excess skin from the lower lids however, this is fraught with many potential problems as it introduces scarring into the actual eyelid mechanism. This can lead to the lower lid becoming 'pulled-down'; a very unsightly look. Remember, the cause of this wrinkling is due to an inherent damage of the skin itself and treatment should be directed at improving the quality of the skin. It is a problem of "quality" not "quantity" of the skin and laser resurfacing helps to restore the "quality" of the skin.